Lince's Painting Blog — Residential and Commercial Painting Servicing Vaughan, Brampton, Mississauga, Richmond Hill, and Greater Toronto Area. Your bedroom is an important space. Your bedroom is where you go for privacy, rest and relaxation, downtime, and reflection. A bedroom can be your own personal sanctuary, so it’s only natural that you’d want it to look great and give off a special vibe. The best way to do just this is by choosing the perfect paint colour for your bedroom, one that speaks to you and really brings the room to life. Here are some helpful tips to help you decide on the perfect paint colour for your bedroom. What better place than your bedroom to showcase your own unique personality? Choosing a bold or vibrant colour is a great way to express yourself and really let your bedroom come to life. Will you choose red to convey your determination and desire to live life to the fullest? Or maybe yellow to encourage positivity and keep yourself smiling every day. No matter which one you go with, bold colours are going to say a lot about you. Neutral colours may be the best choice if you’re looking for a relaxing paint colour that is calmer rather than bolder. You don’t always have to go bold and vibrant when choosing a colour for your bedroom, so feel free to kick things down a notch with a neutral colour. If you’re worried a neutral colour may be boring or bland, try throwing in some nice furniture pieces, linens, and wall art. Soft pastel colours such as pinks, soft blues and greens, and lavenders can look very elegant and grown up if done correctly. Your best bet is to combine any of these colours with bright accessories and dark wood furniture to avoid the room giving off a more childish vibe. Pastels will help you to feel relaxed and at peace in your bedroom; perfect for unwinding after a stressful workday. You might be surprised to learn that the colour of your bedroom can actually have an effect on your sleep quality. Studies have found that blue rooms are the most effective at helping you to catch some z’s, with specific shades of yellow being the second most effective. Green and silver come in third and fourth place, and purple, brown, and gray finish last. If you’re a light sleeper, selecting one of the top sleep-inducing colours could be just what you need to help you sleep better. If you’re at a complete loss as to which colour you should choose for your bedroom, talking to a colour consultant can be just what you need. Colour consultants have plenty of experience matching the right paint colours to the right rooms, and their trained eyes will no doubt help you to make a decision. Following these tips is your first step in having your bedroom be a place of expression, personality, and tranquility. Your perfect bedroom paint colour is out there, so go find it! Picking a good colour pallet that works can be a bit of a challenge if you’re a little rusty on the rules of colour combinations and design that the professionals follow. What’s the best choice for the particular room you’re working with? How can you best use colour to compliment your room’s furniture? Here are a few good tips you can use when looking for the perfect colour pallet for your next painting project. Keeping darker colours closer to the floor and getting lighter as you go up is a great way to make a room look good. You can start with using darker colours on the floor such as dark carpets and baseboards, then move into medium colour values for the walls, and finally light colours for the ceiling. This style of colouring in a room is largely inspired by the earth, with the ground being dark, the trees and buildings being medium shades, and the sky being sunny and bright. Usually, analogous colour schemes (colours that are next to each other on the colour wheel, such as blue and green) are more relaxing and casual when they are combined. These combinations are usually best used in informal or private spaces such as a bedroom. Since the bedroom is the place you go to rest and recover, analogous colour schemes are a perfect choice in this regard. Just like in clothing, black will never go out of style in the world of painting. Though you don’t have to think about painting an entire room black, it’s always a good idea to keep a little bit of black in each room. Maybe consider painting your kitchen cabinets black, or a nightstand in your bedroom. No matter what your decision, keeping a little black in each room will always look great. Contrasting warm and cool colours is not as difficult as you may think. Consider painting a room a cool grey and contrasting it with warmer, say honey-coloured accents to achieve a look that is both easy on the eyes and soothing for the soul. Always try to follow the rule of three and never use more than three different colours to make up your colour pallet. Using more than three colours can make a room look to busy and will give the appearance that its designer couldn’t make up his or her mind. You want your newly-designed room to breathe confidence and style, not have multiple personalities. You may not think it, but looking at what colours you best like to wear is a great way to determine a colour pallet that will work for you. When you go shopping for clothes, you generally pick colours that you feel look good on you, so why not do the same when shopping for paint? Choosing a colour pallet that you associate with and feel good about is a wonderful way to make any room truly yours. Ever wonder why fast food chains use red and orange colour schemes? Why do health spas love blue and green? It’s because colour really does affect our emotions! In fact, the right colour paint can make all the difference between a happy, fun-loving house and a tense, stressful environment. So, which colours should you choose to give a room the right kind of mood? If you’re looking to spark some life into your living room or turn the dining room into the hottest dinner party in town, these colours are for you! ● Red - The colour of passion and optimism. Perfect for sparking lively conversation and stimulating appetites. Too much red can become overwhelming and create anxiety. Good for rooms with a lot of social activity. ● Orange - Stimulates social interaction and promotes reassuring feelings. Good colour for physical motivation. Can be seen as negative for those who associate orange with prisons. A good choice for rooms where you exercise. Choose these hues for rooms where confidence and energy are important such as bathrooms, exercise rooms, or offices. ● Yellow - The colour of energy and happiness. Creates excitement and boosts self-confidence. It’s important to choose the right shade of yellow, as strong yellow can be distressing. ● Purple - Borrowing elements from blue and red, purple promotes both energetic activity and peace of mind. Dark purple is noted for making a room feel sophisticated and dramatic while lighter hues make rooms feel peaceful. Too much purple can make a room feel dark and depressing. ● Blue - The colour of intelligence and serenity. Students are more likely to retain what they study and feel less test anxiety when surrounded by blue. Too much blue can make a room feel cold and deeper shades can make one feel depressed. ● Green - Nature’s own favourite colour, green promotes tranquility and balance. Studies show this colour wards off nightmares. Too much green runs the risk of inciting feelings of envy or jealousy. ● Pink - The sweet and calming colour of love. Studies show pink can soothe even the criminally aggressive. Too much pink can be seen as immature or unsophisticated. These are versatile colours that stand out from the pack. Also known as neutrals, they can enhance the positive and subdue the negative elements in the other colours on this list when paired correctly. ● Black - A strong and formal colour, black promotes feelings of power and independence. Often chosen as paint as an accent to create an elegant, sophisticated mood. In large amounts it can feel oppressive and depressing. ● White - The colour of purity and innocence. White is often used to make spaces feel larger than they really are. Too much white can make a room seem empty or unexciting. ● Grey - Combining elements of black and white, grey adds a flair of drama while retaining an open and airy atmosphere. Be careful to choose the right shade of grey to match the intended mood. If you’re considering doing some home renovations, one great way to drastically change a room is to freshen up the colour of your walls. To do this, there are a few options, and if you’re debating between paint and wallpaper for your home, we’ve got some pros and cons that might help tip the scales. If you’re looking for versatility, you simply can’t go wrong with paint. Wallpaper comes in two different surface materials; vinyl and paper. Each offers a different look, and there’s no question that you can find wallpaper in a wide variety of different colours and patterns, but when it comes to having a wealth of colours and finishes, paint takes the cake. Anything from ultra-matte to high gloss finish is at your fingertips and the colour range is mind boggling. It’s a lot easier to change a colour from room to room, or even to highlight a feature wall, when you choose paint. Before your contractor arrives, walls should be cleared of decor and any drips or cobwebs wiped away. Furniture will need to be pulled away at least a few feet from the walls; ideally it will be pushed towards the center of the room to allow as much working space as possible. After that, the preparation work differs greatly between a wallpaper and a paint job. While paint can be applied directly over a previously painted wall and the job can start right away, it’s not recommended that wallpaper be applied over a previous layer, so the first task for your contractor will be to remove the existing layer of wallpaper. Any accidental damage will have to be filled and sanded, and then the walls will need a coat of primer. A room that could be painted in a day might take a few days to have wallpaper applied. Both painting and the wallpapering process do require specially designed tools. To do a proper job, a painter will be equipped with trays and liners, brushes and rollers, sleeves and drop cloths. Although this might seem like a lot, wallpapering requires far more. Paste is necessary for wallpaper-to-wall adherence, along with a paste brush or a roller to apply it. A knife to cut the paper and a level to hang it properly are also necessary, along with a tape measure, a putty knife or straight edge, a pencil, drop cloth, smoothing brush, a sponge and bucket of clean water. When it comes to supplies, a very good quality paint can cost you about $50/gallon and will be enough to do a standard sized bedroom, while a top quality roll of wallpaper will cost you anywhere from $75 to $100. Besides the cost of supplies, labour for wallpapering can be much more than it would be for painting. When it comes to making a big change in the look of your home, both wallpaper and a fresh coat of paint will do the trick, but painting will go a lot faster and is ultimately more cost effective. The versatility of paint and the colours you can choose from makes this a smart choice. Having good looking, well-painted walls is important to any homeowner. When most people think of a professional painter, they often think of commercial renovations. However, there are many benefits to having your own home painted by professionals. A professional paint job can change the way that your home feels and the way that you and your family feel in it. Aside from guaranteeing a great looking paint job having your home painted by a professional comes with a tonne of other benefits. Below we have the listed the top 5 reasons you should have your home painted by a professional. Most people would agree that you should be spending your time on the things that matter most to you and many of us just don’t have the time to paint our homes ourselves. It may be because we have kids, or because we are needed at the office all day and night. Whatever the reason, if you don’t have the time to renovate your home yourself, especially when it comes to painting, it only makes sense to hire a professional. Every moment you spend on chores like painting is a missed opportunity to spend time with those that you value most. Or a missed chance to make more money at work. Your time is valuable and should be treated that way. A professional painter has years of experience seeing rooms transformed into homes. You can trust the professionals at Lince’s painting with using the right tools and techniques. If you need advice choosing colours that reflect you and the way you want your home feels, our painters are always happy to help. You may think that hiring a painter is expensive since you have to pay for their labour and materials. However doing it yourself can be an even more overwhelming and expensive experience. A professional painter saves you money by being efficient as well as timely and brings his own tools and materials. Professional Painters knows what to do, how to properly prime the walls, paint the trim and how much paint they will need for specific sections of your home. Painting a house is not an everyday thing; people do it once a year and in many cases only once every few years. There is no point of paying for tools which you will rarely use. A professional can save you all the unnecessary costs and headaches that occur during painting. When you consider the cost of materials and the value of your time, hiring a professional is a no brainer. You may have never painted your home before and it can seem overwhelming if it’s your first time. The professional’s at Lince’s Painting have over 20 years of experience painting homes and can work quickly while also providing high-quality work. Painting a home properly is a challenging task and something that you want to be done right. The walls in your home surround you daily and it’s important that they look good. If you want to ensure a job is done properly, you should hire a professional painter today. Professional painters do so much more for each job than amateur painters. Someone without as much experience may not plan and prepare their paint job well enough before starting. They might mix too little paint, use too much on certain areas creating uneven colours, or simply do a bad job. A professional painter; however, will make sure the painting areas are prepared, will use the right tools, and will deliver better results in less time. The next time you have a major painting project, either residential or commercial, you can trust Lince’s Painting to get the job done right. Call us today for your free consultation. What Colour Should You Paint Your Kitchen? Are you in the process of building a new home or perhaps you’ve decided to take the plunge and renovate? Maybe you’ve just moved into a home where the previous owners’ colour choices leave a lot to be desired. Choosing paint colours for your home can be an exciting and stressful process, and even more so when it comes to making those choices for the heart of your home; the kitchen. Most of us tend to spend a lot of our waking hours in our kitchen, and it can be a wonderful gathering place for friends and family alike. It’s important that your kitchen reflects both smart functionality and your personality. The experts at Lince’s Painting have gathered some great tips together to help you pick colours that let you enjoy this sometimes underappreciated room. Your paint choice may be somewhat limited due to the natural light in your home. Even with plenty of artificial light, a kitchen may look unwelcoming or heavy with a dark paint colour. It may even make space appear smaller. If you don’t have the option to add more natural light to your kitchen but you have your heart set on a dark colour, consider using that colour on a feature wall or even on some of your furniture or decor. On the flip side, if your kitchen has plenty of natural light, this may open up some possibilities for adding the dramatic flair that a dark or rich wall colour can bring. 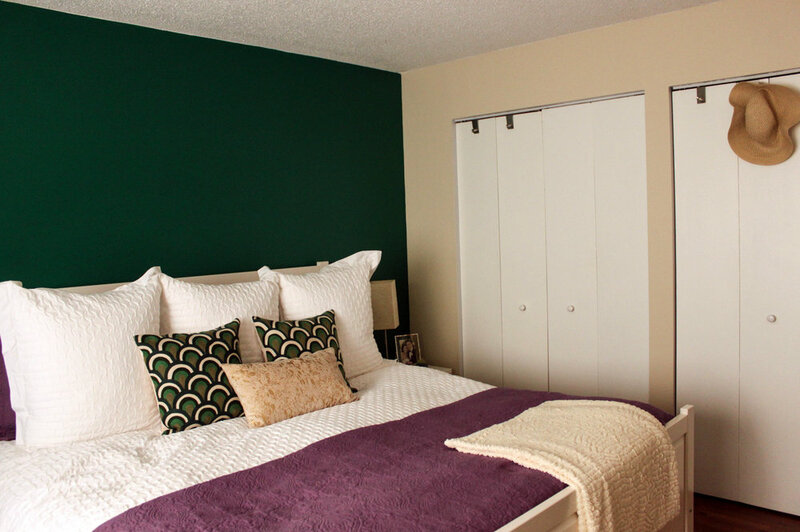 Think about how your wall colour choice will complement the existing colours in the room. Will the colour make your cupboards pop as you’d hoped, or does it blend and flow more naturally? There’s no right or wrong answer, only take into account how your colour choice works with the floors, cupboards and the furniture in the room. Certain colours lend themselves well to evoking a particular mood or feeling. Yellow increases energy, blue motivates and increases efficiency, while lavender will make you feel calm and green offers tranquillity and health. Interestingly, red is said to increase appetite. Each colour can have warm or cool undertones and colours can shift fairly drastically depending on lighting throughout the day. If you are unsure of how the colour will change throughout the day your best bet is to paint a tester patch and see how it looks from morning through to the evening. If you’re not sure how long you’ll be living in your space, or if you’re sure that a sale is in your future, it’s prudent to consider the buyers when painting your kitchen space. When considering a home, the kitchen is one of the very first things a potential buyer looks at, and every buyer wants to easily picture themselves in the space. Neutral doesn’t mean boring, and it certainly doesn’t mean you can’t put splashes of your personality in easily removed decor or furniture. A more neutral colour on the walls can actually give a more pleasing background against which your favourite pieces shine. The next time you are looking to have your kitchen painted, feel free to contact the experts at Lince’s Painting. We have experience painting many kitchens and can help make sure it is a smooth and stress-free process.